Pectolytic enzyme blend with secondary activity designed to proficiently increase yeast aromatic thiols revelation. 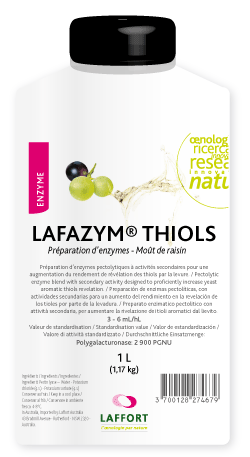 LAFAZYM® THIOLS is an enhancement tool mainly for rosé and white wines aromatic profile and intensity. Its use can reduce the time needed for traditional stirring of juice lees during stabulation, thereby significantly lowering production costs associated with cooling. LAFAZYM® THIOLS has a statistically significant impact on 3SH and 3SHA revelation. LAFAZYM® THIOLS increases the aromatic impact of pre-ferment cold stabulation also known as “lees scraping”. LAFAZYM® THIOLS increases wines aroma potential in a significant way, and works with all yeast strains. Although, its use alone will not make up for the strain effect of high thiol producing yeast strains. To optimize the aromatic impact we recommend using ZYMAFLORE® X5, ZYMAFLORE® DELTA or ZYMAFLORE VL3. LAFAZYM® THIOLS acts in synergy with yeast nutrition as well as aroma protection tools to optimize wines thiol potential.